Nestled in the Andes Mountains between Bolivia and Peru, Lake Titicaca is the highest navigable lake in the world at over 12,000 feet above sea level. The Lake, covering almost 28,000 square miles, is home to the Uros, one of the most fascinating people groups anywhere in the world. Nearly 1,000 years ago, the Uros, seeking to escape from the encroaching Inca Empire, built a series of about 40 man-made, floating islands from the reeds of the totora plant, found on the shores of the lake. The islands were then floated out onto the lake and anchored with reeds driven into the lake's floor. The general idea was that the islands could be moved to a different part of the lake in the event of an attack. Today, although many of the Uros people have moved to the mainland, several hundred still live on the floating islands much as their ancestors have for a thousand years. Maintaining the islands keeps the island dwelling Amerindians busy constantly, the surface of each islet needing to be redone every three months or so. The totora reed still provides the material from which the islands are refinished, as well as providing important food and medicinal products to the Uros people. 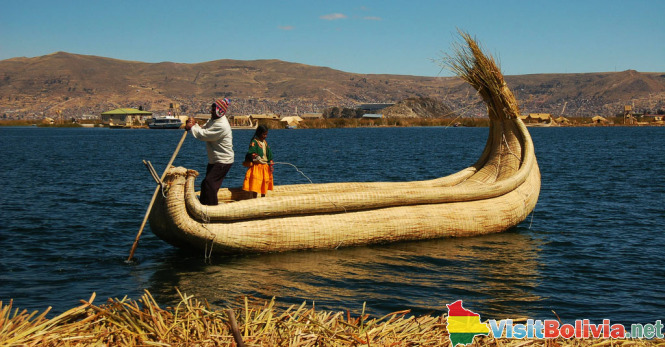 Excursions to the Uros Islands are available, the most popular departing is from the Peruvian side of Lake Titicaca in Puno. Excursions are reasonably priced, and generally consist of a two to three hour boat ride to the Uros islands, and often to some of the natural islands on Lake Titicaca as well. Money earned from tourism to the islands helps support the education system available to the Uros' children. While on the floating islands, tourists will notice immediately that the reeds below their feet sink 2 to 4 inches with each step they take. While this is an unusual sensation, most don't find it unpleasant. The Uros people, most of whom still dress in the bright colored, traditional costumes of their ancestors, are warm and friendly to tourists, and you will be able to watch as they weave fresh reeds into the top layer, continually renewing the island's surface. On many excursions, lunch is provided with the Uros or other island dwelling people. The menu consists mainly of local fish and dishes made from the totora reed. While the Uros Islands were not able to help their people get away from the Inca or the Spaniards in the long run, they will provide an unforgettable getaway for you.